World four hundred and twenty-seven is with many boxes on narrow space. Go LEFT and push LEFT. Go UP and push LEFT. Push DOWN, go UP, UP, UP, LEFT, push LEFT and LEFT. Go RIGHT, DOWN and push LEFT. Go DOWN, push DOWN, go RIGHT and push UP. Go LEFT, UP, UP, RIGHT, RIGHT, RIGHT, DOWN, DOWN, push LEFT, LEFT, go DOWN, LEFT and push UP. Go RIGHT, DOWN and push RIGHT. Go UP, RIGHT, RIGHT, DOWN, RIGHT, RIGHT, UP, push LEFT, LEFT, LEFT and LEFT. Go DOWN, push RIGHT and RIGHT. Go LEFT, UP, UP, UP, LEFT and push DOWN. Go UP, LEFT, LEFT and push DOWN. Push RIGHT, go UP, RIGHT, RIGHT, DOWN, DOWN, DOWN, LEFT, LEFT, LEFT and push UP. Go DOWN, LEFT, LEFT, UP and push RIGHT. Go LEFT, UP, UP and push RIGHT. Push DOWN, go LEFT, DOWN, DOWN, RIGHT, RIGHT, RIGHT and push UP. Go DOWN, LEFT, LEFT and push UP. Go DOWN, RIGHT, RIGHT, UP and push LEFT. Go RIGHT and push RIGHT. Go DOWN, LEFT, LEFT, LEFT, DOWN, DOWN, RIGHT, push UP, go LEFT, UP and push RIGHT. Go UP, RIGHT, RIGHT, DOWN, DOWN, push LEFT and LEFT. Go RIGHT, RIGHT, UP, RIGHT, RIGHT, DOWN, push LEFT and LEFT. Go UP, UP, LEFT, LEFT, DOWN, push RIGHT and RIGHT. Go DOWN, RIGHT, RIGHT, UP, UP and push LEFT. Go UP, UP, LEFT, LEFT and push DOWN. Push RIGHT. Push DOWN, go RIGHT, RIGHT, DOWN, DOWN, LEFT, LEFT and push UP. Go LEFT and push UP. Push RIGHT, go LEFT, LEFT, DOWN, LEFT, LEFT, UP, push RIGHT and RIGHT. Go DOWN, DOWN, DOWN, LEFT, push UP and UP. Go RIGHT, RIGHT, RIGHT, DOWN and push LEFT. Go UP, RIGHT, UP, UP, UP, LEFT and push LEFT. Push DOWN, go UP, RIGHT, RIGHT, DOWN, DOWN, DOWN, LEFT, LEFT, LEFT, LEFT, UP, UP, UP, push RIGHT and RIGHT. Go LEFT, LEFT, DOWN, DOWN, DOWN, RIGHT, RIGHT, RIGHT, DOWN and push LEFT. Go UP, LEFT, LEFT, UP, UP, UP, RIGHT, RIGHT, DOWN and push DOWN. Go UP, UP, LEFT, LEFT, DOWN, DOWN, DOWN, RIGHT and push RIGHT. Go DOWN, RIGHT, RIGHT, UP, UP and push LEFT. Go RIGHT, DOWN, DOWN, LEFT, LEFT, UP, LEFT, LEFT, UP, UP, UP, RIGHT, RIGHT, DOWN and push DOWN. Go RIGHT, RIGHT, DOWN, DOWN, LEFT, LEFT, DOWN, LEFT and push UP. Go RIGHT, RIGHT, RIGHT, UP, UP, LEFT, LEFT and push DOWN. Go UP, RIGHT, RIGHT, UP, UP and push LEFT. Go RIGHT, DOWN, DOWN, DOWN, DOWN, RIGHT, RIGHT, UP, UP and push LEFT. Congratulations. 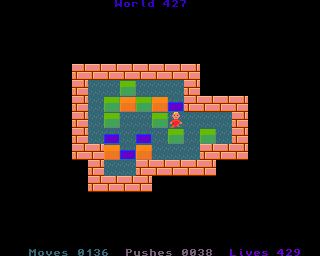 You have completed world four hundred and twenty-seven. Get ready for world four hundred and twenty-eight.